The March 2019 issue features an editorial on what Australia can learn from the North American opioid crisis. 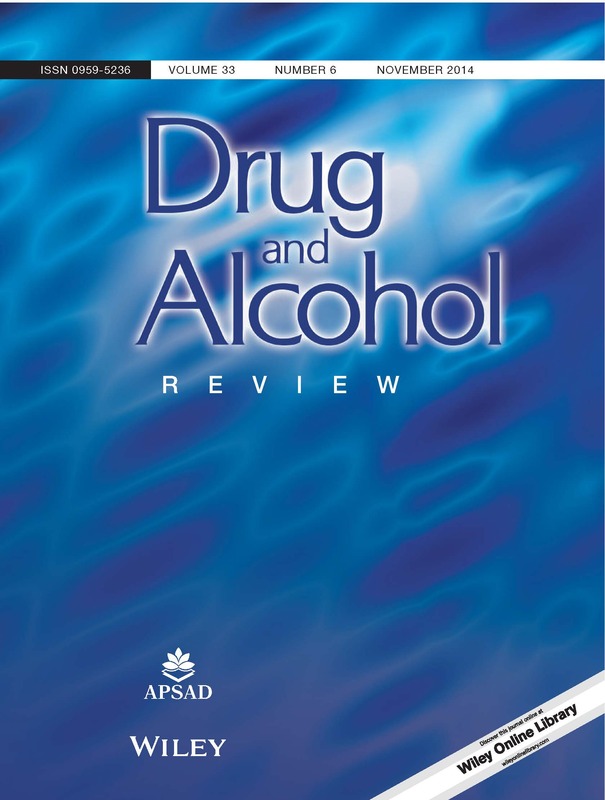 The issue also contains papers on a range of topics, with a mixed methods study of tobacco, alcohol and gambling industry donations to Australian political parties, and papers on barriers and facilitators to switching from smoking to vaping, predictors and reasons for starting and sustaining quit attempts in a national cohort of Aboriginal and Torres Strait Islander smokers, a prospective cohort study on injecting drug use as an independent risk factor for reincarceration after release from prison, uptake of direct acting antiviral therapies for the treatment of hepatitis C virus among people who inject drugs in a universal health‐care system, mortality among people who inject drugs, and parental drinking in Australia. What's new on Early View? In Australia, alcohol was the cause of over 5500 deaths and 150 000 hospitalisations in 2010. It is estimated that 10 to 38% of emergency department presentations are related to alcohol, but many cases are unidentified. If patients with alcohol use disorder (AUD) are not identified, it can lead to acute alcohol withdrawal, complicate emergency assessment and diagnosis and cause harm to the patient. A recent study by Qian et al aimed to investigate the actual management process for alcohol‐related presentations in a teaching hospital in New South Wales. The authors conducted a retrospective audit, identifying 367 patient presentations with a primary or secondary discharge diagnosis of AUD between 15 November 2016 and 15 February 2017. Two hundred and ten presentations, incurred by 199 patients, were then randomly selected. The authors investigated six key management steps: identification of alcohol use disorder, documentation, thiamine, alcohol withdrawal assessment, benzodiazepine for alcohol withdrawal and referral to the drug and alcohol consultation liaison service. The 210 presentations were made by 199 patients; 30.2% (60) female, 69.8% (139) male and age ranging from 14 to 90 years old. Qian et al noted that 91.4% (192) of the 210 presentations had an initial presenting problem that was not directly related to alcohol (e.g. abdominal pain), which shows the difficulty of fully disclosing alcohol‐related morbidity at the initial presentation. Overall, only 6.2% (13) of the 210 presentations were formally assessed by a Mental Health substance use form, as no formal alcohol screening tool was in place. Of all the 210 presentations, 77.1% (162) were identified with AUD in the initial assessments; 64.3% (135) were documented with alcohol use history, 49.5% (104) were prescribed with thiamine, 48.1% (101) were assessed with the alcohol withdrawal scale, 41% (86) were prescribed with benzodiazepine for alcohol withdrawal and only 38.6% (81) were referred to the drug and alcohol consultation liaison service. Only 8.6% (18) of the initial presentations were directly related to alcohol and only 6.2% (13) were formally screened for alcohol use. The results showed that more than 90% of the presentations were not screened with a formal screening tool. This study showed that more than a fifth of the presentations were not identified with AUD in the initial assessment by the triage nurse, emergency department medical officer, specialty medical officer or ward nurse and approximately a third of these presentations did not have documentation of alcohol use history. The authors also noted problems in treating patients with alcohol withdrawal. Their study showed that of the 58 patients who suffered from moderate or severe withdrawal or developed complications, 16% were not prescribed with thiamine and 21% received oral thiamine instead of the recommended parenteral thiamine. Also, only 2% of these patients received the recommended loading dose regime of benzodiazepine, while more than 30% of the 210 presentations did not receive any benzodiazepine. Finally, Qian et al reported that more than 60% of these patients were not referred to the hospital Drug and Alcohol Consultation Liaison, missing the opportunity to optimise care and provide relevant education. Qian et al identified gaps in the management of patients with AUD, showed the need to routinely use an alcohol screening tool to screen patients at the initial presentation and demonstrated that the alcohol management of patients with AUD in hospitals needs to be improved. The authors suggest that further research is required to investigate why some patients with AUD were not referred to the Drug and Alcohol Consultation Liaison service and how to improve the management of these patients across the continuum of care.